On Tuesday 9/30, we took a five-hour train ride from Toronto to Montreal. I knew to expect Quebec to be very French-speaking, but I was still surprised by how very dominant French was there. As we crossed from Ontario to Montreal on the train, the announcements switched from being English first French second to French first English second. How many time zones are there in Canada? 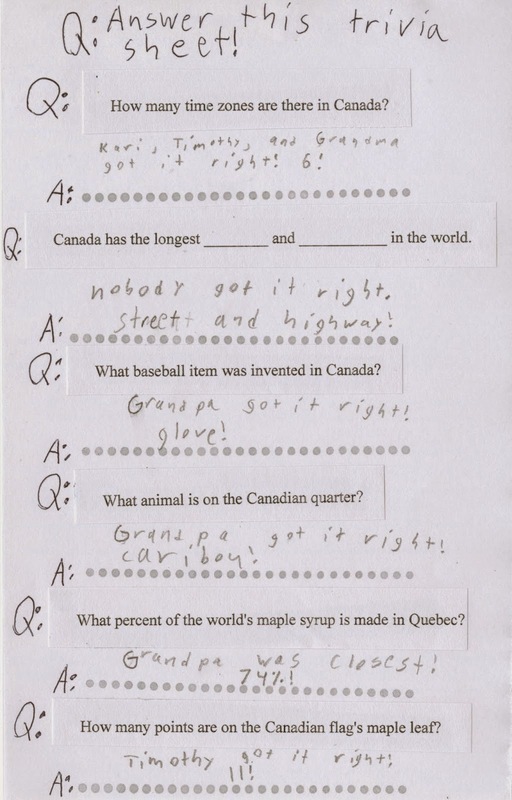 Canada has the longest ___________ and _____________ in the world. What baseball item was invented in Canada? What animal is on the Canadian quarter? What percent of the world's maple syrup is made in Quebec? How many points are on the Canadian flag's maple leaf? The answers (and who got each question right) are on this page. 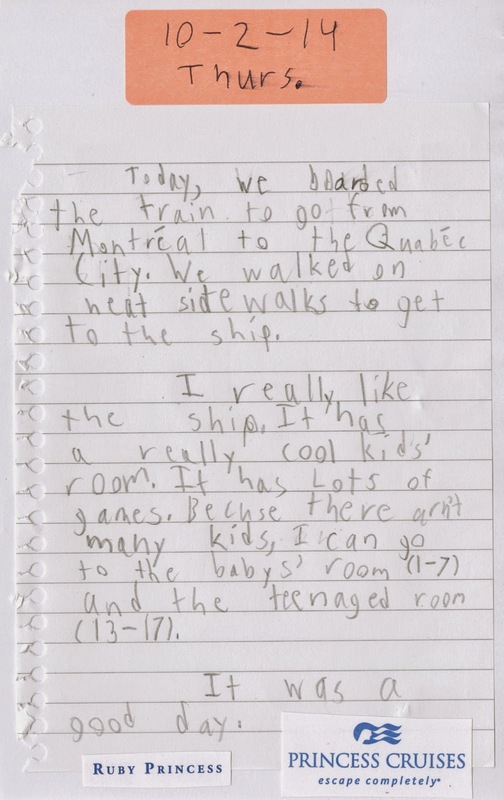 We spent all of Wednesday 10/1 exploring Montreal. The highlight was visiting the Underground Pedestrian Network. I had no idea that such a thing existed. Another fun thing we did today is to start making a list of differences between Montreal and Toronto. Aside from practically everything being in French in Montreal, we also noticed far more smoking, more litter, more graffiti, pay phones, different emergency vehicles, and more fall colors. Toronto was more child-friendly. 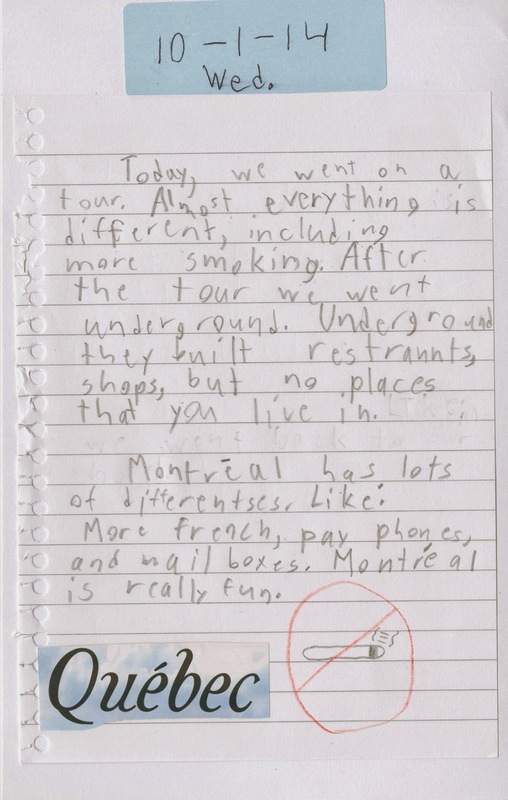 Trevor asked each of us to rate Montreal from 1-10 (with 10 being the highest) on eight different criteria. We overwhelmingly agreed that Montreal was different, but our responses on the other topics had quite a bit of variety. 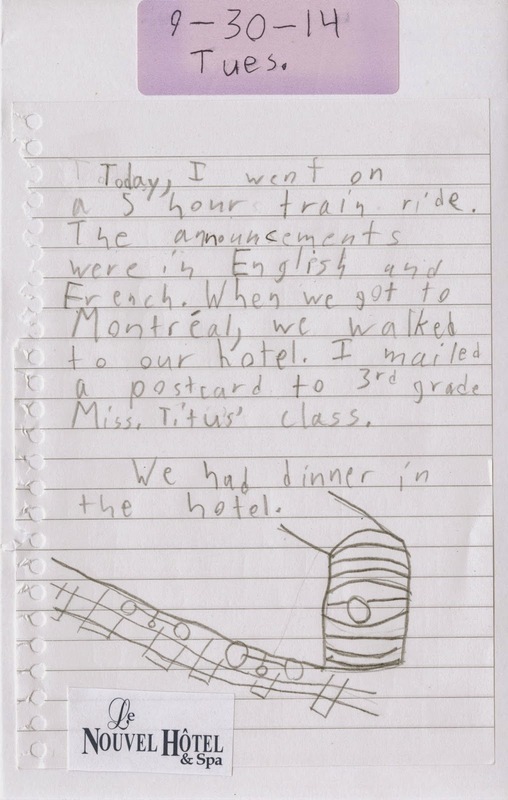 On Thursday 10/2, we took a three-hour train ride from Montreal to Quebec City. The view from the train was gorgeous. Quebec is stunningly beautiful in the fall. When we arrived in Quebec City, we walked about a mile to board our cruise ship, the Ruby Princess. 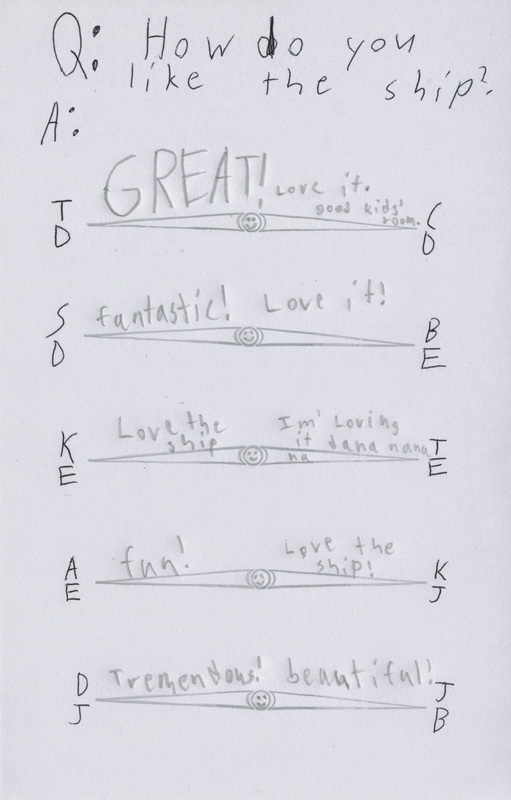 The Question of the Day asked how we liked the ship. We all loved it. Overnight, our ship moved from one pier in Quebec City to a different pier just a mile away. We spent the whole day exploring Quebec City. 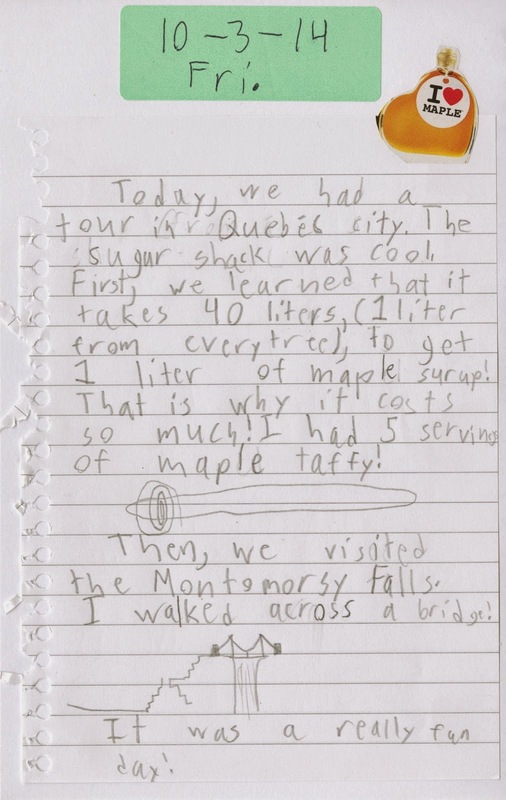 We toured a sugar shack and ate fresh maple taffy, visited Montmorency Falls and walked on a bridge over the falls, and explored the streets downtown. It was a great day. Trevor asked everyone what Montmorency Falls was like. 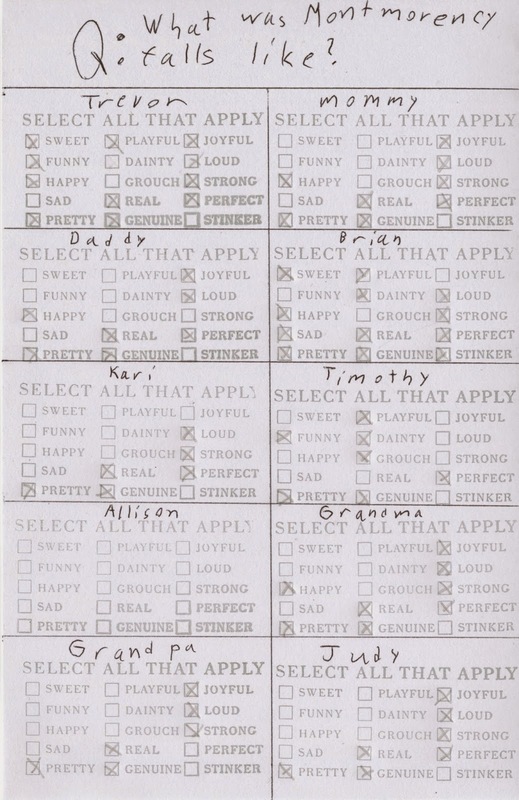 He'd used one of my random clear stamps to create a checkbox. I chose happy, pretty, real, genuine, joyful, loud, strong, and perfect. These are so cool! I love that Alison is participating in the Q&As, too. Terrific. I love all his drawings too! I love this! I feel like I'm going along for the vacation, too! 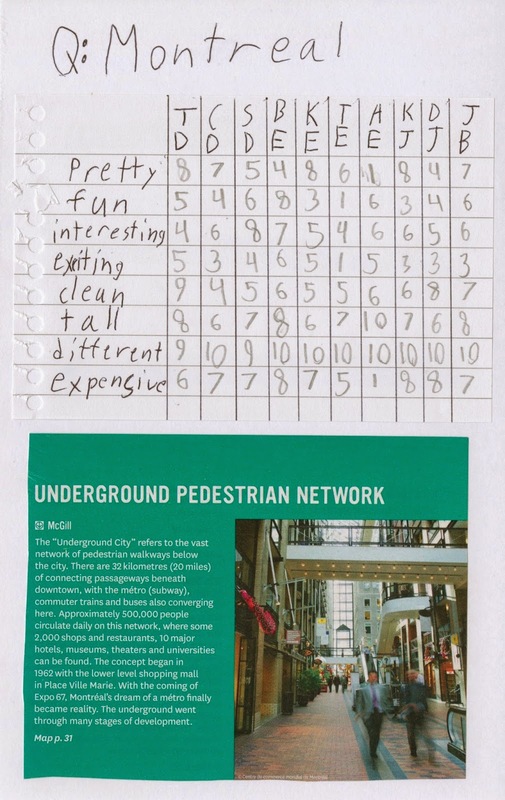 :) That is so cool about the Underground Pedestrian Network! They have some here in our downtown area, and I've heard people mentioning restaurants and a theater down there, but I've never been. I'm sure it's not nearly as nice as this one!